Japanese cuisine is all about eating the right portion and healthy foods. One such dish is Miso-Glazed Eggplant, which is baked to perfection and is cooked using eggplants and miso. To prepare this lip-smacking snack recipe, preheat the oven at 250 degrees Celsius. On a chopping board, slice the eggplant into equal halves and chop the spring onions coarsely. Transfer these in separate bowls. Smear refined oil on each half of the eggplant. Place the halved eggplant slices onto a baking tray. Place the baking tray in the preheated oven. Let these roast 5 minutes and then flip the slices to the other side. Keep roasting for 15 minutes or until the eggplant acquires a soft texture. Once done, take the eggplants out and let them cool down. In the meantime, take a bowl and mix together miso, soya sauce, white vinegar, black pepper powder with half a tablespoon of water. Mix to perfection to create a miso sauce. Now, add half of the sesame seeds with half of the thinly sliced spring onions in the miso sauce. Brush the eggplant slices with the prepared miso sauce. Now, place the eggplant slices on the baking tray and roast these in the oven at 250 degrees Celsius for 10 minutes or until they appear partly charred. Post grilling the slices, remove from oven and transfer on a plate. Generously garnish with the remaining sesame seeds and spring onions. 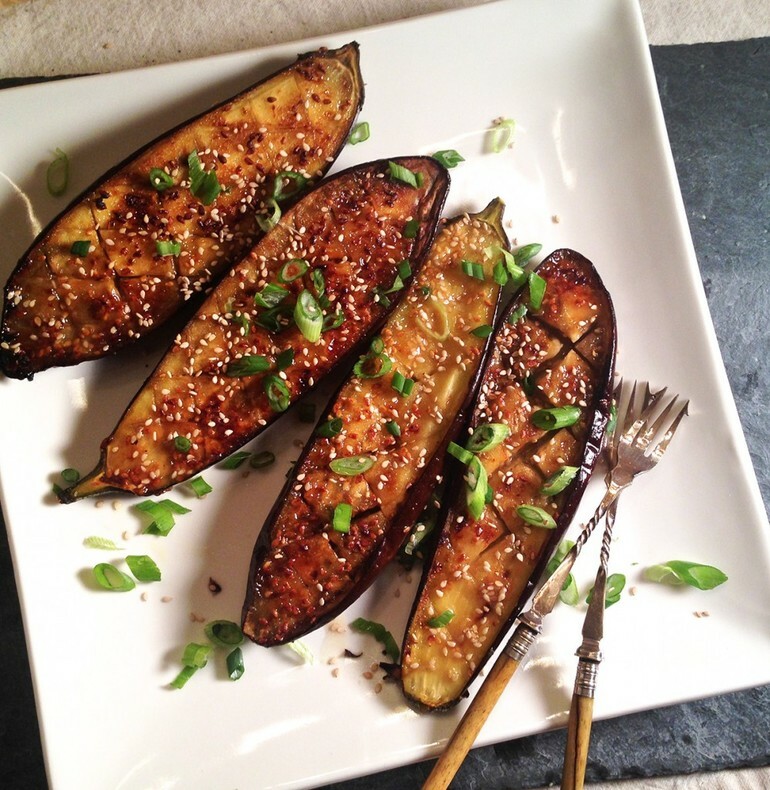 Serve these miso-glazed eggplants hot to enjoy!